According to the British Museum, humans were writing messages at least 5,000 years ago. 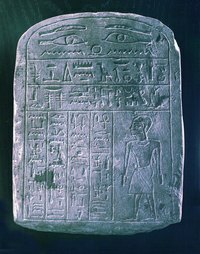 Experts believe ancient Egyptian hieroglyphic writing -- the kind you often see carved on stone tablets -- was reserved for ceremonial occasions. A simpler "demotic" form of the symbols appeared in everyday messages. The secret of deciphering hieroglyphics was lost for centuries, until in 1822 the French intellectual Jean-Francois Champollion discovered the symbols represented sounds in the Egyptian language. You can make a replica Egyptian sandstone hieroglyphics tablet, using simple materials and techniques. Put 2 cups of plain flour into a large bowl. Make a well in the center of the flour and pour in approximately one-half cup of water. Mix the water into the flour with a tablespoon, until it forms a sticky, loose ball of dough. If the mixture is very stiff and dry, add a little more water. Pour 2 cups of sand over the ball of dough. Use the spoon to fold the sand into the dough ball. Knead the dough with your fingers, working it thoroughly until the sand grains are distributed evenly throughout the mixture. Make a well in the center of the dough ball and add 2 tablespoons of white glue. Knead the ball again, until the glue is distributed evenly throughout the mixture. The glue helps the various elements of the mixture bond together. Measure out another cup of sand. Add it in handfuls to the mixture, working it into the surface of the dough ball, until it has the texture and color of sandstone. Spread a plastic bag flat on your work surface. Turn out the dough ball onto the plastic bag. Flatten the ball with your fist and shape it with your fingers until you have formed a roughly square tablet, around one-half inch thick. Your tablet will look more authentic if you do not finish its edges too neatly, but instead leave them a little roughly shaped. Turn the tablet over to reveal a smooth surface, ready to receive the hieroglyphics. Copy hieroglyphic symbols with a notepad and pencil, using images of ancient Egyptian carvings for reference. Alternatively, try an online translator. Draw your hieroglyphic design directly onto the surface of the tablet, using the point of the pencil. Erase any errors by smoothing out the marks with your fingers, then try writing the symbol again. Leave your tablet to dry out thoroughly in a warm, airy place. Turn the tablet over every four hours, until it has set hard and firm. It will take around a day for the the tablet to set completely.